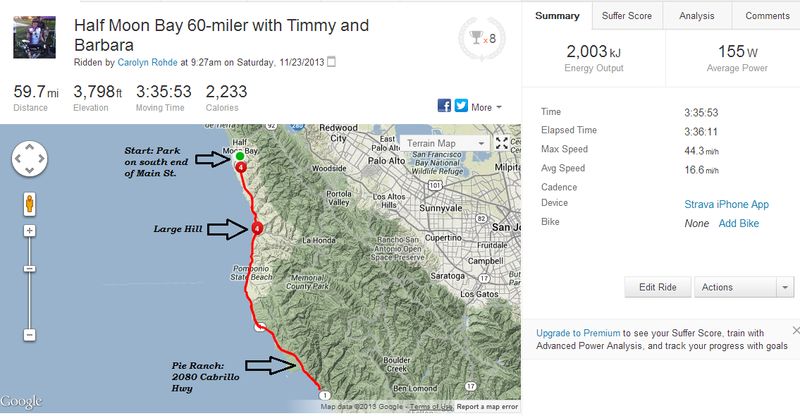 Bay Area Bike Ride: Half Moon Bay (Hwy 1) – Where's The Tofu? What a scenic and incredible bike ride on Saturday! I met up with Katie and Barbara (they’re doing IM New Zealand!) and some others to do a 60 mile ride in Half Moon Bay, a ride I had never done before. And it may rival Paradise Loop as my favorite! It’s beautiful, decently challenging with the number of hills, safe, and directions are easy. You just stay on Highway 1! Starting & Ending Point: We parked on the southern most end of Main Street where it meets Highway 1. There’s a fire station right there, too. Map and directions. But the cool thing about cycling on Highway 1 is that you can start from virtually anywhere. 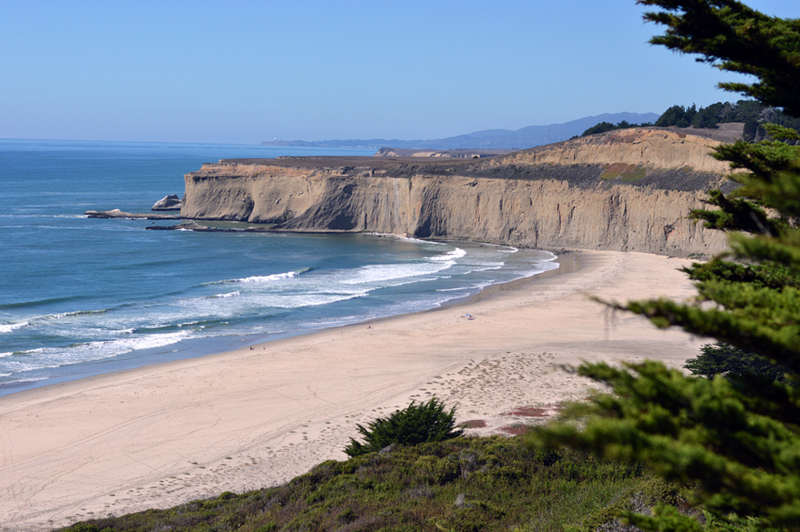 You can start in Santa Cruz and come up towards Half Moon Bay and back, for example. Or start somewhere in the middle. Your day, your ride, your call! Mileage: We did 60 miles total — 30 miles out and back. But again, you can do as much or as little as you want! Heck, you can bike down to San Diego if you wanted. No route maps, route sheets or getting lost! Just stay on Highway 1 until you want to turn around and come back. Amazing! There’s a dedicated shoulder separated by a white line that’s several feet wide. That’s in contrast to other parts of Hwy 1 in Marin where you have to share the road with cars. It’s unbelievably scenic. You are literally riding along the Pacific coast the entire time with varied scenery, coastal cliffs, surfers, lighthouses, beaches, and vast blue ocean. We didn’t stop at all, just powered through the 60 miles, so I couldn’t really take photos. But I should’ve brought my GoPro! It’s not very crowded with other cyclists, at least it wasn’t on Saturday morning. We encountered maybe 3 other groups at the most. There are great restaurants to enjoy a post-ride meal afterwards. Check out Half Moon Bay Brewery (that’s where we went) or cruise along Main St. There was also something called Pie Ranch that we saw on our ride about 25 miles south of Half Moon Bay. It’s a 45 minute drive from SF without traffic. Getting home in the afternoon can take much longer, so make sure to budget for that. Bring as much nutrition as you can! There are very few gas stations or rest stops to fill up water or get energy bars. There’s one but don’t count on it being open. It’s pretty darn hilly, with a ton of rollers. And ~6 miles south of Half Moon Bay there’s a pretty long and challenging climb. But if you’ve done rides around the Bay Area this won’t be too out of the ordinary. It was pretty windy going South, but we had a nice tailwind coming home. I’ve heard the wind can get pretty gnarly. Trash and random items everywhere! Why do people throw their shoes out the window? Or do they fall off when they’re dangling their feet outside the window? Has anyone done this ride before? What else did you like or not like? Thanks everyone! Swim. Bike. Run. Eat Plants. Next Post Earn Your Thanksgiving Meal! This is a great ride. It often gets really windy on the way back especially as it gets later in the day, so it’s important to get an early start. That big hill around mile 8 is fun on the way out but very difficult on the way back, so it’s important to conserve energy. As far as coastal rides, this is right up there with Point Reyes. Thanks Carolyn! Yes I wish I had known to conserve my energy! That hill was killer coming back. Thanks for the comment Chris! Pingback: Week 11: Green Machine | Where's the Tofu?